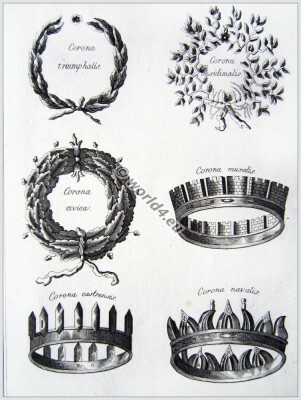 Ancient Roman crowns and wreaths. 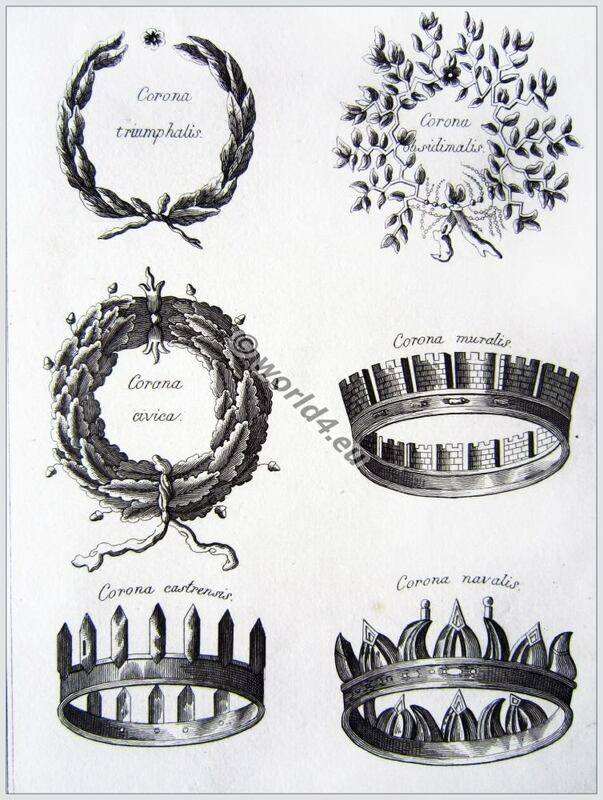 Home » Ancient Roman crowns and wreaths. The Corona Triumphalis was considered the highest honor a military commander in the Roman Empire. The Corona obsidionalis or graminea (“siege crown”, “grass crown”) was a military distinction in the Roman Empire. It was awarded to the generals who succeeded to free his laid siege army. She was made of bundles of grass and flowers that were picked where the army was trapped. For the first time it is mentioned in Polybius. It consisted of a wreath of oak leaves (quercea) and was awarded the one who saved the life of a Roman citizen (civis) a fellow citizen in battle, killed the enemy whose armor had taken and was able to hold the place of those rescued. It was passed by the rescued themselves. In early republican period it was made from the leaves of holm oak (Quercus ilex). Later, she was bound from the branches of the pedunculate oak (Quercus pendunculata). With the Corona Civica special privileges were connected. Thus, the owner sat at public games with the Senators and all had to get up on his entrance. The corona muralis (Latin: corona, crown ‘murus, wall’) was an award of the Roman army. She had the shape of battlements and was one of the most coveted awards for soldiers. The corona muralis was awarded during a city siege to the person who first stormed the ramparts of a hostile city. According to the records of Polybius it was made of gold, had the form of a city wall with gate and was fastened by a band at the head of the wearer. In imperial times it was awarded mainly centurions. The camps or wall crown, a reward for for the one who had first entered the camp of the enemy or the hostile Wall mounted first. The Corona navalis (ship crown), and Corona rostrata (prow crown) or corona classica (Fleet crown) was a Roman military award. It was awarded in the Roman navy to the soldier who sat the first in the fight foot on an enemy ship. It consisted of gold and looked like an ordinary laurel wreath inlaid with Ramm spur. Originally, it was only to a consul who destroyed an enemy fleet as Admiral. Marcus Terentius Varro got it from Gnaeus Pompeius Magnus in the war against the pirates. Marcus Agrippa Vipsanius is depicted on coins with various different forms of Corona navalis. This entry was posted in Ancient, Headdresses, Military, Roman and tagged Ancient Roman headdresses, Crown on 9/8/13 by world4.